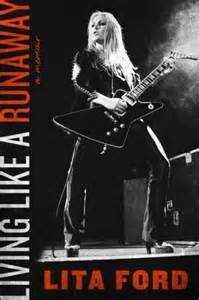 Lita Ford's Autobiography "Living Like A Runaway: A Memoir"
It was impossible for Lita Ford to know how the name of her first band would become part of such an appropriate title for her autobiography 40 years later. At the age of sixteen she became the guitarist for the groundbreaking all female teenage rock band “The Runaways.” Lita blazed a trail for women in rock especially with her amazing guitar playing ability. No one was ready to believe that a female, much less a teenager, could shred the guitar like she could. In her book Lita reveals the trials and tribulations of being part of The Runaways, from management issues to band member conflicts to hardly getting paid for any of it. Her story takes us all the way up to 2015 as she continues to rebound from a fifteen year hiatus and a troubled, painful marriage. Her story is one of hope and inspiration, fear and failure, defeat and conquest. Most of all, it is written from her heart as we get a close look at the inside world of rock and roll from a woman’s point of view. Love it or hate it Lita Ford connected with a lot of famous rock stars. Some are presented as nice guys, others not so much. It can be a rude awakening to read about people that you thought you admired only to realize they might not be the kind of idol that you really want to follow and model yourself after. Lita tells it straight from the heart, even when it doesn’t reflect well on her. She is not just a talented musician, she’s an icon, a queen, “The Queen of Heavy Metal” as some have said. I highly recommend this book to anyone who thinks they aren’t good enough, don’t have what it takes, or get their feelings hurt by rejection. If you believe enough in yourself, no one can stop you. Lita is living proof.